This accessible book introduces students to the theories, concepts and skills required to promote an event successfully. To promote an event effectively it is essential to understand marketing, but it is also important to recognise that it is not just consumers who are the audience: other publics who may not necessarily attend can have a fundamental effect on the success of an event as well. Uniquely therefore, this book covers two related themes: marketing and public relations in an events context. This will offer events planners a comprehensive guide on how to promote events to a range of audiences, and on how to use this to manage an event’s long-term reputation. 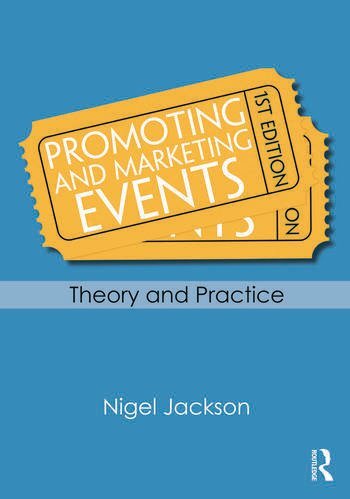 The book focuses on core marketing and PR current theory specifically relevant to the events industry and introduces topics such as marketing strategy, the consumer, marketing PR and how to use the internet to promote events. It integrates a range of international case studies from small-scale events to mega-events to help show how theory can be applied in practice. It further includes inserts of interviews with practitioners in the field, to offer insight into the realities of event communication and to show how to overcome potential pitfalls. Learning outcomes, discussion questions and further reading suggestions are included to aid navigation throughout the book, spur critical thinking and further students’ knowledge. The book is essential reading for all students studying Events Management, and provides valuable reading for students, academics and practitioners interested in marketing and public relations in general. Nigel Jackson is Programme Manager in Events Management at the University of Plymouth.